You are viewing the archived Bank ratings. Follow the link to view the current Bank rating page. Compare banks in New Zealand at Canstar Blue. TSB Bank, ASB, ANZ, BNZ, Kiwi Bank, The Co-operative Bank and Westpac were rated on customer service, the way problems and inquiries were dealt with, fees/charges, interest rates and overall satisfaction. Canstar Blue research finalised in March 2017, published in May 2017. 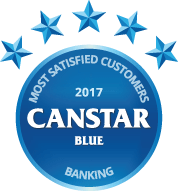 Part of the New Zealand financial landscape since 1850, TSB Bank take top honours for Overall Customer Satisfaction in Canstar Blue’s 2017 review. In today’s fast moving fintec world, good old fashion customer service is still top of the wish list for people when it comes to rating their bank. Canstar Blue’s latest survey involving 2,412 Kiwis, revealed that it’s the banks that can provide the personal touch and deal with problems and enquiries efficiently, that wins our hearts. And it was a triumph for the New Zealand banking sector with TSB Bank, The Co-operative Bank and Kiwibank taking the top three spots on the podium. When it comes to customer loyalty, it seems that our banks can rely on us staying put for a considerable amount of time. Three quarters of us said we have had the same Every Day Account for more than five years, rising to an incredible nine out ten people in the Baby Boomer age bracket. And what happens if we’re not happy with our bank? Not much according to our survey with a mere 4% of people reporting to have swapped banks in the previous 12 months (dropping to an even lower 2% amongst Baby Boomers). In an increasingly ‘cashless’ society, we’re also pretty loyal to our credit and debit cards too, with three out of four people using them more often than cash. And if we want to check our accounts, transfer money or pay someone, we’re much more likely to be doing that via a laptop or mobile device as 80% of people say that now do most of their banking online. The Canstar Blue survey also revealed that despite raging debates around an aging population, superannuation entitlement age and saving for retirement, nearly one quarter of us (22%) feel uncomfortable thinking about our long-term financial future and less than half of us (46%) are saving for retirement. Gen Yers, although better at sticking to a budget, aren’t so good at saving for the future with less than half (only 47%) actively saving for their retirement. Thankfully there looks to be a huge reality check when we reach our thirties as the proportion of Gen Xers saving for retirement jumps to 61%. Canstar Blue commissioned I-view to survey 2,500 New Zealand consumers across a range of categories to measure and track customer satisfaction. The outcomes reported are the results from customers who have one or more accounts or products with a bank – in this case, 2,412 New Zealanders.